Today only: CC 'Trep Takeover is almost here! Budding entrepreneurs, take notice! Tune in today from 5:30-7:30 p.m. CST to CC 'Trep Takeover, an evening made just for the startup business community, featuring expert panelists who will speak about their entrepreneurial experiences and answer questions via Twitter. This event, which is free to the public and will be held in Launer Auditorium, is for those who want to get real answers from real experts. Not in Columbia, Mo.? No problem! Check it out on Twitter using #TrepTakeover. Or watch it live! For more information about the event and to read bios of the panelists, check out the CC 'Trep Takeover Spotlight story. If you're passionate about carving your own path in the business world, do not miss this event! 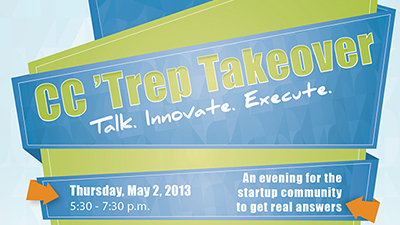 Thursday, May 02, 2013 Chk out- Today only: CC 'Trep Takeover is almost here! any guy who lists Hugh Hefner as one of his interests and/or inspirations on his social media page; a man who has made a living objectifying women and degrading them, has no business speaking at this college which was founded on better principles.